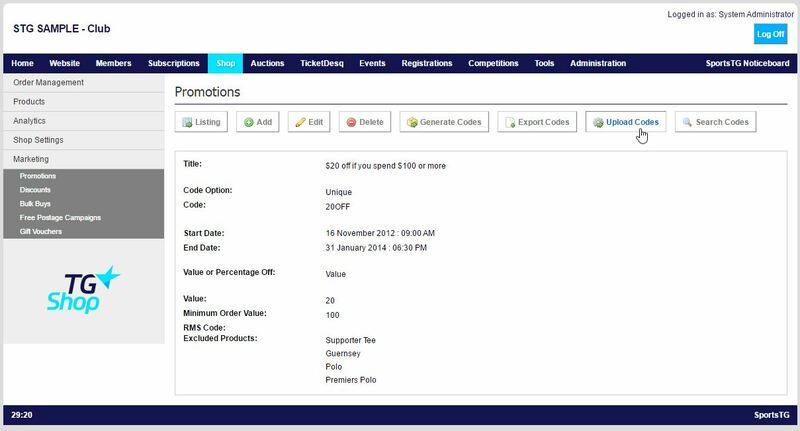 If your organisation has a Promotion Code that is set to Unique, you then have the option to upload promotion codes into the system. This allows organisations to create a large number of promotion codes for members or previous customers and create them easily in the Management Console. 3. Click View next to the Promotion Code that you wish to upload codes into. 4. Click Upload Codes at the top of the page. 5. Upload a .CSV file with your codes. This file should have only one column with the codes within this column. It should not have a heading row. 6. Click Upload Codes and the file will be uploaded and the codes ready to use. Note: When uploading codes, the system will allow a maximum of 2500 codes per upload. If you have more codes than this, then split your file into multiple files, ensuring that no file contains more than 2500 rows.